Swoon Swoon Swoon. Buy Buy Buy. Love pining lyrics and concept records? Boy do we ever! Museum Mouth is our new favorite band not from New England. The Southport, North Carolina 3-piece, formed in 2011, has released two EPs and three full-lengths. 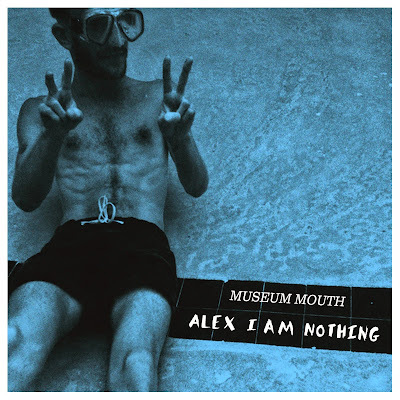 Their most recent release, Alex I Am Nothing (2014) on Self Aware Records is their debut vinyl pressing and available for purchase via Self Aware’s website for $11.99 or digitally via Bandcamp for $5. Alex I Am Nothing starts off in the most honest recollection of the notorious unintentional and instantaneous crush. From this point on we are mere listeners to the emotional roller-coaster of Karl’s infatuation for, and ultimate dismissal of, his "handsome and boring" (and straight) nerd. In short, Karl's got it bad. A no frills punky 10-track record of quivering heart on sleeve vocals, each song is a verbal diary entry as the concept album navigates the rough terrain of unrequited love. With vague similarities to Indiana’s High Dive, the tension is thick, the melody is poppy garage punk and the storyline gets uncomfortable, “conflicted and crazy”. The record was written from summer 2012 to spring 2013 when it was recorded over the span of a year in various bedrooms and guest rooms and bathrooms and basements all around NC. And nobody knows why Karl cut all his hair off.